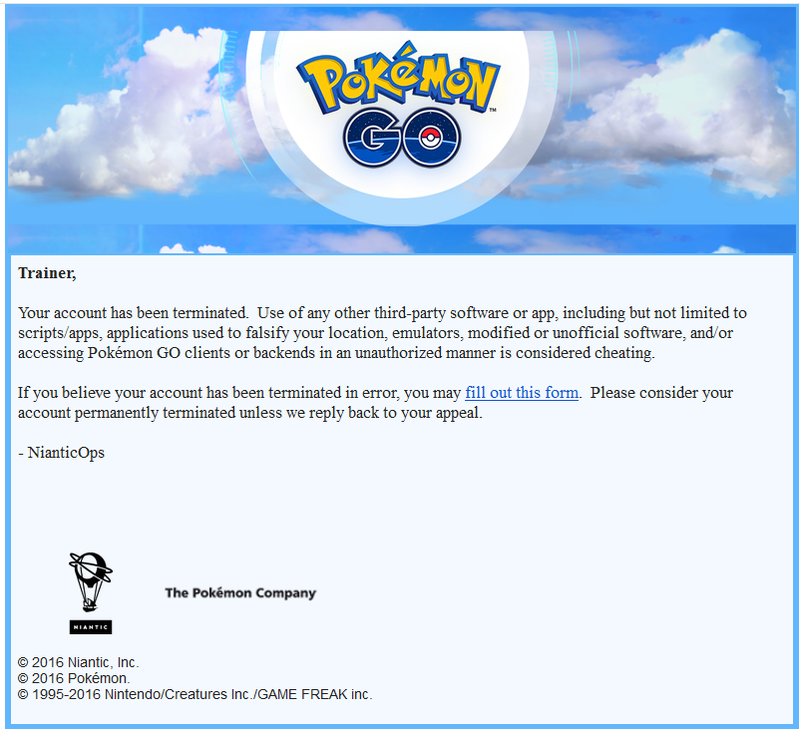 Emails are being sent out informing Pokemon Go players that they have been banned from the game, but it seems that not all of these emails are legitimate. However, some users have reportedly received fake emails that are not coming from Niantic Labs, either though the email address and contents have been perfectly recreated. These emails also tell the players that their account has been terminated and ask them to fill out a form, but gamers will log on to the app and notice that they have not actually been banned. It seems that at the moment the vast majority of the emails are real, but there are a few fake ones going around, so users will want to be extremely careful clicking any links. The only URL that should appear in the legitimate email is to this page on the Niantic Labs website that allows you to appeal your ban. If you aren’t sure about the legitimacy of the email, make absolutely sure that’s the URL you’re being sent to. However, just because the email says your account has been terminated but you haven’t been banned doesn’t necessarily mean it was fake. Some players who created their Pokemon Trainer Club account with a different email address than they used for Pokemon Go have noticed that they can still log in with the app. Others have received the real email and used the same address for both, but they are still not banned, meaning Niantic has either sent out some of these notifications by mistake, or these players have been banned but there is some sort of a delay in it being registered by the game. There are also some gamers who say they have been banned from the app but have not yet received one of these official emails. Some Pokemon Go players are reportedly being sent phishing emails that tell them they have been banned. How can you tell if these are real or fake?